Besides a clear colour LCD display of the Elegant console, the Vision elliptical cross trainer X20 convinces by its joint-gentle magnetic brake system with a balance mass of 10.5 kg. Your workout becomes even more comfortable with a stride length of 51 cm, a low pedal space, and motion-dynamic pedals. The Vision elliptical cross trainer X20 Elegant offers 13 programs and is compatible with the optionally available Passport-Box for further multi media functions. The Vision elliptical cross trainer XF40i Elegant has an induction brake system with balance mass of 10 kg. Together with elliptical motion and dynamic, comfortably padded pedals, your joints are minimally stressed. The clear computer offers 13 programs for diversion while exercising. In addition, you can connect the optionally available Passport Set-Up Box for even more variation and multi-media workouts with the Vision elliptical cross trainer XF40i Elegant. The Vision elliptical cross trainer S60 is an extremely sturdy constructed equipment. It has a balance mass of 11 kg, a low pedal space, and the Perfect-Stride technology for joint-gentle workouts. 12 programs and 25 levels of difficulty provide long lasting fun. The Vision elliptical cross trainer XF40i Touch is equipped with a precise induction brake system with balance mass of 10 kg. Stride length of 51 cm, pedal space of 7 cm, and dynamic, well padded pedals provide comfort. The XF40i with Touch console offers 17 programs. In addition, the optional Passport Box with multi media function can be connected. Besides Touch-Screen, the Vision elliptical has an iPod connection. After workout, you can fold up the Vision elliptical cross trainer XF40i Touch in a space-saving way. The Vision elliptical cross trainer X20 Touch has a magnetic brake system with a balance mass of 10.5 kg. A stride length of 51 cm, 5 cm pedal space, and motion-dynamic pedals provide a joint-gentle concentric run. Besides 17 programmes, the X20 with Touch console offers "Passport ready" as well, that means you can connect the optionally available Passport Box with multi media functions. In addition, the Vision elliptical cross trainer X20 Touch is equipped with a touch-sensitive LCD screen and an iPod connection. Vision Fitness elliptical cross trainers offer all conveniences you expect from modern elliptical crosstrainers and exceed these in decisive points from beginner elliptical cross trainers to professional elliptical cross trainers of commercial quality. 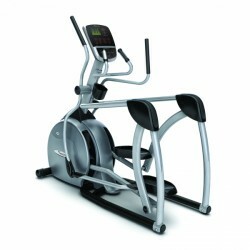 Vision Fitness elliptical crosstrainers stand for natural and joint-gentle motions and well-balanced training programs. Elliptical cross trainers are always space-efficient and compact. Vision Fitness elliptical crosstrainers are characterized by their individual configurability. Besides the elliptical cross trainer X20 models, the Vision elliptical cross trainer XF40i also offers the choice between different training computers. Whether you are a purist on the elliptical cross trainer or looking for an elliptical cross trainer with a hightech console meeting almost all needs regarding programmability. Vision Fitness elliptical crosstrainers give you the choice !